What Crows Are Heckling You? Do you ever feel like circumstances of life or other people are keeping you from living the life you would like to live? I know I have. A couple of weeks ago, I heard this awful, loud, noise coming from somewhere close to my house. I went in search of what it could be and as I got closer to the back of our house, it got louder. 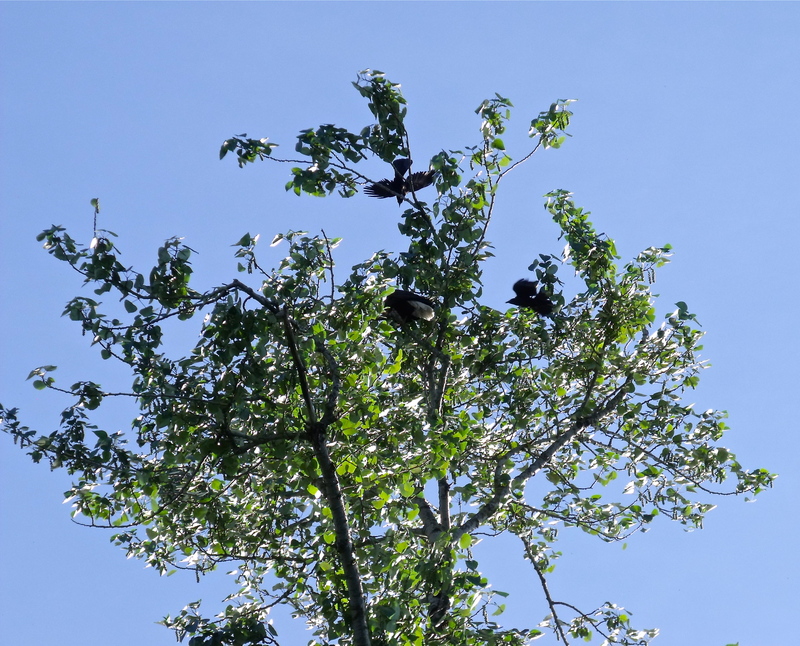 I opened the back door and walked out to see one tree in particular completely covered and surrounded by crows! I couldn’t imagine where they all came from. There was at least 40-50 of them! I knew from reading about eagles, the crows must have an eagle surrounded. As I got closer, I saw a young eagle sitting down in the branches. The crows were acting crazy and the eagle just sat there. A specific area we need to improve. What do I know? I know that God has a plan for each of us. He wants to speak to us and keep our dreams alive! He is the author of dreams! He wants to use us. The eagle isn’t afraid of the crows! They are just an annoyance. So the eagle will wait until they get tired of annoying him, or are distracted, and then he will take flight! That’s a good lesson for us. Those annoyances around us are just that; satan and/or our own thinking trying to keep us from our best. Surrender it all to Him. Let God give wind to your wings so that you can be strong like the eagle and fly to places God wants to take you. Eagles have focused vision and can see clearly for a VERY long distance. The eagle didn’t keep looking back to see how close the crows were. He kept his focus forward on his destination; away from the crows. God wants to do that for you today! He will give you focus on the next stream of refreshing! What or who are the crows in your life that keep you from being who God wants you to become? Do you have some radical person that will come to your rescue and chase away the crows to help you focus on where you need to be going? Just like the eagle did, wait on Him snuggled down in His branches, until He gives you the all clear, and then fly like you have never flown before! He will take you to places you never dreamed of! That is a promise! Previous postWill You Sell Out? This was very timely for me JoAnn. I do appreciate it. I hassle with the “crows” a lot. sometimes I just don’t know what to do to get rid of them, or at least stop paying attention to them. I am encouraged to keep my focus forward and not backward or “over my shoulder”. it doesn’t matter what it happening behind me, it matters to me what is a head! thanks for sharing, May God bless you and keep you and make His face shine upon you. It was such a great picture and when I saw it, that was my first thought. Amazing how when we are open, God will speak! I’m so glad it gave you some encouragement. Love how God can use simple things to give a profound message. So happy to hear how it helped! That’s the way God wants to use this blog. Thanks for responding, sharing it and subscribing! God bless! very good as usual–I like the eagle’s determination and sight on the goal, and I like the “crazy lady” who screamed (reminds me of the Savior) to free the eagle from his would-be captors. thanks!